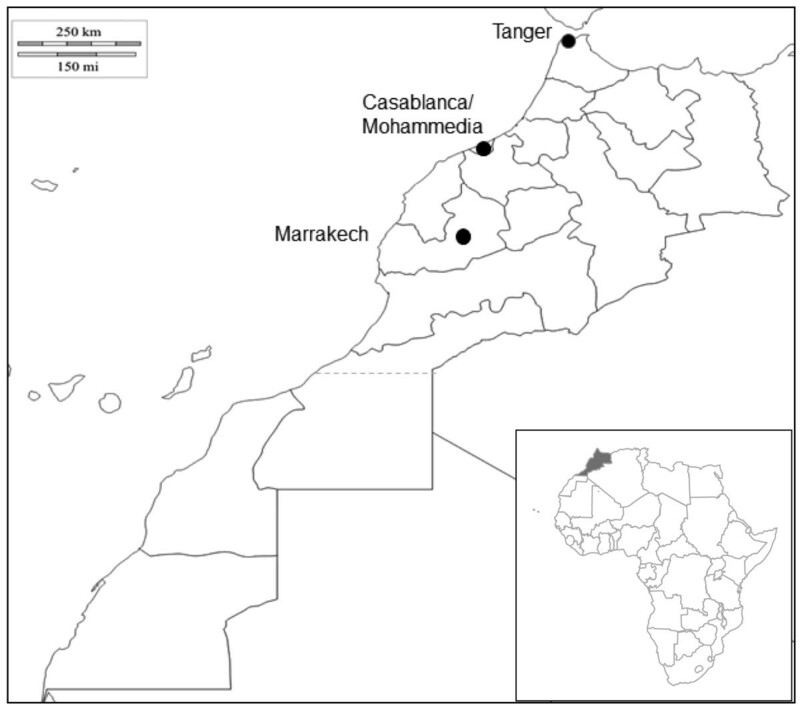 Culex pipiens L. is the most widespread mosquito vector in temperate regions including North Africa. Cx. pipiens has two recognized forms or biotypes; pipiens and molestus are morphologically indistinguishable with distinct behavior and physiology that may influence their vectorial status. In our study, we prospected for the different forms of Cx. pipiens in Morocco. Cx. pipiens larvae were collected in 9 sites throughout Morocco during summer 2010 and reared until imago stage. Cx. pipiens was identified using diagnostic primers designed for the flanking region of microsatellite CQ11. We established the presence of both forms of Cx. pipiens and their hybrids in Morocco. Molecular identification provides the first evidence of the presence of Cx. pipiens form molestus in Morocco and hybrids between pipiens and molestus forms in North Africa. The epidemiological implications of our findings are discussed. The Culex pipiens complex includes several species; Cx. pipiens pipiens Linnaeus, 1758 and Cx. pipiens quinquefasciatus Say, 1823 are the most ubiquitous mosquitoes in temperate and tropical regions, respectively. Cx. p. pipiens has two distinct forms or biotypes: form pipiens and form molestus which are morphologically indistinguishable and differ in physiology and behavior. Cx. pipiens form pipiens is subjected to diapause (heterodynamic), is anautogeneous (only lays eggs after a blood-meal), and eurygamous (unable to mate in confined spaces). On the other hand, Cx. pipiens form molestus Forskal, 1775 does not diapause (homodynamic), is autogeneous (lays first batch of eggs without taking a blood-meal) and stenogamous (mates in confined spaces) [1, 2]. In addition, the biotypes molestus and pipiens occupy distinct habitats in Russia and the northeastern United States. Indeed, molestus form occurs in underground areas in urban settings while pipiens form lives aboveground [3, 4]. In Europe, sympatric occurrence of both biotypes has been observed in aboveground habitats as well as in underground habitats [5–7]. The two forms did not seem to be genetically isolated and were reported to hybridize in the United States and Europe [6–8]. They have different trophic preferences: pipiens biting mainly birds and molestus feeding on mammals, whereas hybrids exhibit an opportunistic behavior and can readily feed on both hosts. These feeding patterns are thought to influence the transmission of avian and mammalian pathogens. In North Africa, Cx. p. pipiens is a competent vector of several pathogens infecting animals and humans including West Nile virus , Rift Valley Fever virus [10–12] and filarial worms [13–16]. Based on morphological characters, behavioral and reproductive specializations, the mosquito Cx. p. pipiens was described in the North African region [17–25]. Nevertheless, these classical characters present limited value. Therefore, our study aims to identify members of the Cx. pipiens complex present in Morocco based on a molecular identification. Mosquitoes were collected as larvae using the “dipping” sampling method during summer 2010 from three Moroccan regions (Figure 1). A total of 9 sites were classified according to the habitat (urban, suburban or rural) and the type of breeding site (aboveground or underground). Fourth instar larvae were used for morphological identification  and reared until imago stage at 28 ± 1°C with 80% relative humidity and a 16 h:8 h photoperiod. Emerged adults were conserved at −20°C for subsequent molecular characterization. Localization of the collection sites in Morocco. DNA extraction from F0 individuals was performed using the method of DNAzol as described in the manufacturer’s protocol. Specimens were identified as belonging to the Culex pipiens complex using a multiplex PCR assay described in Bahnck and Fonseca (2006) . The locus CQ11 was used to distinguish between the two forms of Cx. pipiens. The DNA fragment size amplified varied between pipiens and molestus allowing us to distinguish the two forms in a single PCR reaction (Figure 2). Specimens of Cx. pipiens molestus from Japan were used as control. 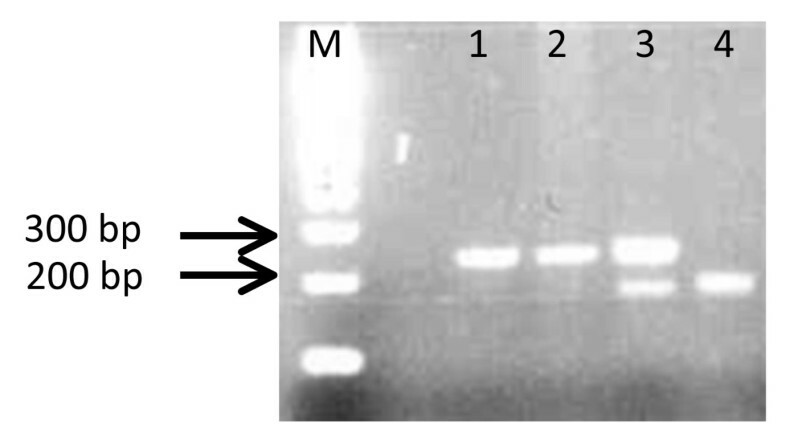 Example of PCR amplification of the flanking region of the CQ11 microsatellite of Culex pipiens collected in an underground site in Casablanca (Morocco). DNA was extracted from individual mosquitoes and identified by PCR amplification of the flanking region of the CQ11 microsatellite. Lane M: 100-bp size marker; Lane 1: control Cx. pipiens form molestus from Japan; Lane 2: molestus form; Lane 3: pipiens form; Lane 4: hybrid form. A total of 214 adults were characterized by PCR and frequencies of different forms are represented in Table 1. Overall, 52.3% of adults tested were homozygous for the 200 bp fragment which is characteristic of the pipiens form, 22% were homozygous for the 250 bp fragment identifying the molestus form and the remaining (25.7%) corresponded to hybrids. Cx.pipiens larvae were collected at various sites in Morocco, reared to adults and identified by PCR amplification of the flanking region of the CQ11 microsatellite. In brackets, number of tested mosquitoes. This study provides the first molecular evidence for the presence of Cx. pipiens form molestus in Morocco and hybrids in North Africa. The molestus form has been described as a distinct species, Cx. molestus Forskal, 1775 from autogeneous Egyptian specimens. Because Cx. pipiens form molestus is stenogamous and autogenous, it colonizes underground areas in urban settings  with limited geographic distribution throughout the world. In our study, Cx. pipiens form pipiens and form molestus were found in urban, suburban and rural habitats. Indistinctly, the two forms co-occur in aboveground and underground breeding sites. Sympatric distribution of the biotypes molestus and pipiens in surface breeding sites has been observed in southern Europe and the United States [5, 6, 8] and in underground breeding sites in North Europe . Until now, hybrids were mainly reported in the United States [4, 8] and South Europe . Our findings corroborate the presence of hybrids in all breeding sites sampled. Hybrids between molestus and pipiens forms are considered of great epidemiological importance. They exhibit intermediate physiological and behavioral traits  and can readily feed on avian and mammalian hosts [8, 29]. This opportunistic biting behavior will potentiate the role of Cx. pipiens as a bridge-vector for the transmission of pathogens such as West Nile virus, from birds (amplification hosts) to humans [8, 30]. We thank Laurence Mousson for technical help. FA was supported by the “Division Internationale” of the Institut Pasteur. This work was funded by the Institut Pasteur (ACIP grant A-08-2009) and the European Commission Framework Program Seven Award “InfraVec”. FA carried out mosquito genotyping, contributed to the interpretation of results and drafted the manuscript. MT participated in the design of experiments. MS participated in the design of experiments and mosquito collections. ABF designed the experiments and drafted the manuscript. All authors read and approved the final manuscript.